Originating in Italy, mozzarella is traditionally made from water buffalo milk, although cow’s milk mozzarella is perhaps more common in British supermarkets. While most cheese is aged before consumption, mozzarella is a fresh cheese that can be eaten immediately and is stored in brine due to its high moisture content. When cooked, mozzarella is famously stringy and creamy, making it a fantastic topping cheese. Paul Ainsworth’s pizza Giardinera spectacularly demonstrates why pizza and mozzarella are culinary soulmates, while Ander Waters’ vegetarian lasagne recipe is pure comfort food. A staple of the patriotic caprese salad, mozzarella's bright white can be a striking addition to colourful dishes. 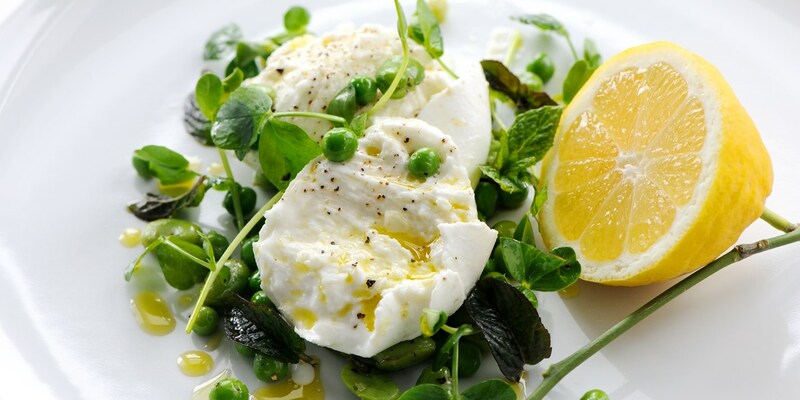 Robert Thompson’s buffalo mozzarella with broad beans and peas combines incredibly fresh flavours, such as lemon, olive oil and mint, in a gloriously simple starter recipe, proving that mozzarella is just as delicious eaten raw. If you love Italian food, you'll love Great Italian Chefs... have a sneak peek at our new website and stay tuned for our full launch later this year. Quiz: Can you guess the cheese? Great British Cheese Awards – cast your vote!